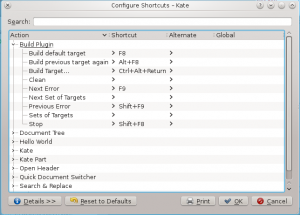 Kate comes with a build plugin, which supports running make, or ninja, or actually any arbitrary command directly from within Kate. 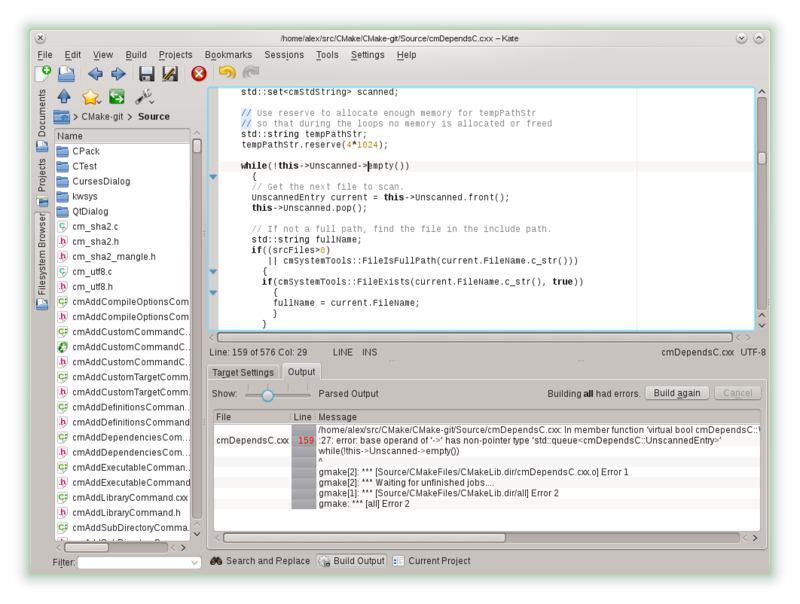 This is obvisouly useful when using Kate as development editor, and this plugin has seen several improvements for the 4.13 release. 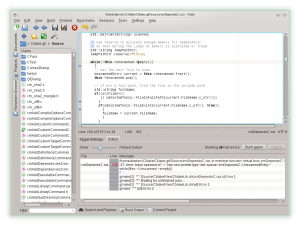 A small change, but for affected developers a major improvement, is that Kate can now parse warning and error messages from the Intel compilers, icpc and icc. 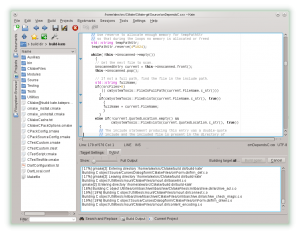 So for those of you using icpc, Kate can now automatically jump to the line of code which caused the error. Actually you don’t have to wait for 4.13 for this, it is already available since 4.12.3. 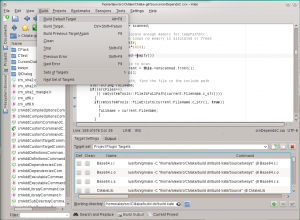 Beside that, there are improvements which benefit all users of the build plugin. Let’s start with a screenshot, which already shows one of the major changes. 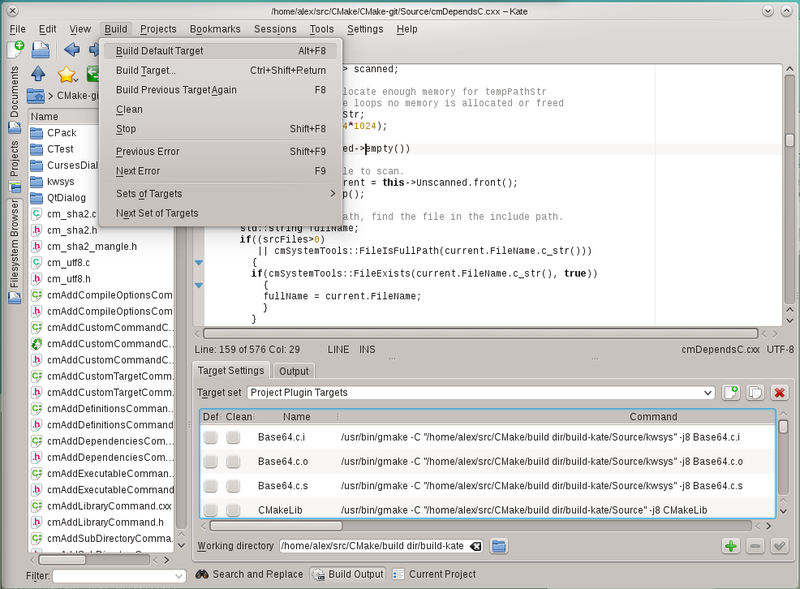 Up to 4.12, it was possible to create multiple “targets”, and each of these targets could contain a “Build” command, a “Clean” command and a “Quick” command. As of 4.13, the build plugin is not limited anymore to these three commands. As can be seen in the screenshot, every “target set” can now contain an arbitrary number of actual targets. They are listed in a table widget. To add a target, click the green “plus”-button in the lower right. This will append a target to the end of the list. It can be edited by simply double clicking it (or pressing F2 while keyboard focus is in the table). One of the targets can be marked as the “default” target. This will typically be the target which runs “make all”. Additionally one target can be marked as the “clean” target, this will typically be “make clean”. For these two special targets separate keyboard shortcuts can be assigned, so they are always quickly available. Now to the actually interesting part: building something. There are multiple ways how to start building a target. 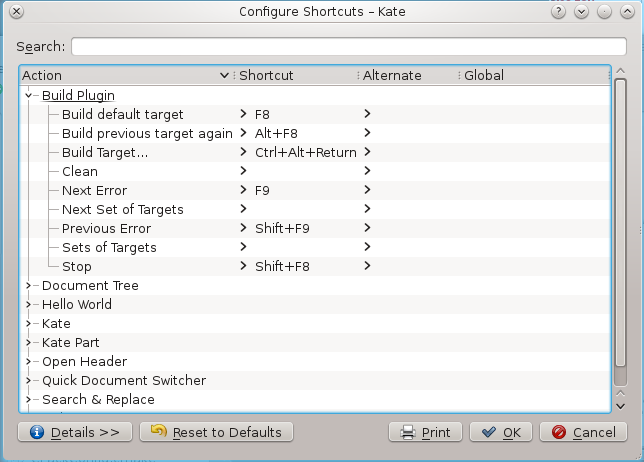 The default and the clean targets can be built directly using keyboard shortcuts, in the screenshot above I assigned F8 to the default target. To build another than the default target, you can select the target you want in the table and then build it by clicking the blue “check”-button next to the “plus” and “minus” buttons. 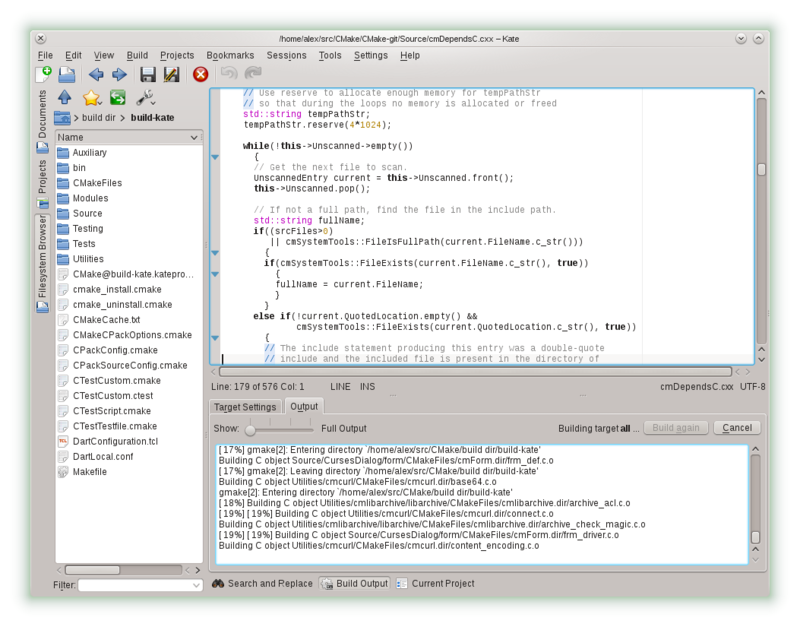 Once building has started, the output is displayed in the log view. As can be seen, there is only one output tab left, where the “level of detail” can be adjusted using a slider. While building, the plugin automatically switches to the log display. 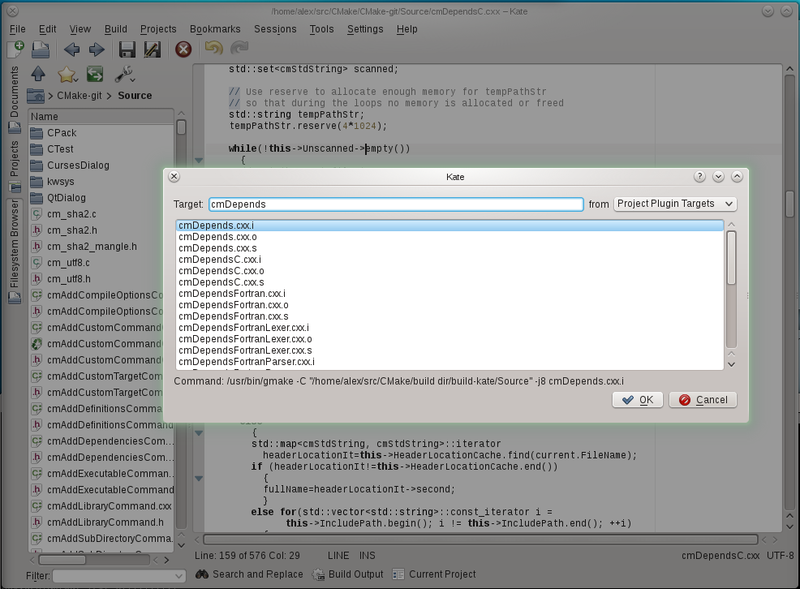 Build plugin showing the output while building. Also new, there is now a simple status display, which tells you which target is currently being built or was built previously. Next to it, there is yet another way to start a build, the “Build again” button. Once some target has been built, using this button the same target can be built again. Oh, and there is now also a button to cancel a build, in case you forgot the assigned keyboard shortcut. When building has finished, the output tab automatically switches to a parsed output mode, which lists the warning – and error messages. By double clicking on one of them or using the keyboard shortcut of your choice, I assigned F9, you can jump directly to the line of code which caused the error. Build plugin showing the parsed errors after the build failed. All that together, should make the build plugin even more useful than before. Kate: What’s cool, and what should be improved? Where is it getting that long list of targets from? They look like they’ve come from the cmake file; is there a particular format we can use in response to eg: make kate-targets # that would enable integration? Thanks Alex; and format for: make katetargets? On target settings I’ve configured working directory to smb share: smb://192.168.1.110/workspace/lcd_test but it didn’t work. Why I think it can be useful? For example compiling projects on Raspbrry Pi. I’ve figured out that jumping to errors works when you mount your smb share into a corresponding path on your computer. This means that if you mount for example /home/user shared folder to /media/raspi – it will not work, it has to be the same path on both devices – in my case /media/workspace share is mounted in /media/workspace on my laptop. Is there a way to disable automatic switch to parsed output in case of error? 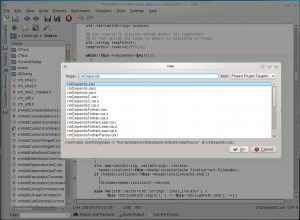 I have assembler which is producing error log output in somewhat different format, and on parsed view there’s nothing displayed, so I always must click to switch back to full output. So it would be nice from Kate to NOT switch to parsed view when full output is non-empty, but error tree is empty (for tools like above). I’m not sure, if parsing also “stdout” is good idea (maybe yes, if “stderr” is empty, but it may then parse also quite bogus outputs of tools which don’t produce error/warning diagnostic at all but something completely different, yet somebody launched them through Kate). And I will check if I can modify the assembler to use “stderr” in future.